Fire Safety Month is Here!! Fire safety month is a great time of year to educate those on what to do if you experience a fire. When you hear your smoke detector go off, or realize you have a fire. It is important not to panic. You need to exit the building as quickly as possible closing all doors, and windows on your way out if possible. Always, check for heat before opening any closed doors. You do this by placing the palm of your hand on the door. It is also very important to stay as low to the ground as you can, because smoke rises, and smoke inhalation can be fatal. After vacating the building immediately call 911 so they can send your local Fire Department. If you are unable to get out there are things you can do to spare time while waiting to be rescued. Stay low of course, and get a wet blanket if at all possible to put over you. This helps prevent smoke inhalation. Always stay in one spot in an open area if so the Fireman can find you. If you hear them calling for you make sure you make noise. If the smoke is not thick you can yell, but it is better to make other noises. You can bang on the wall, or floor, even blow a whistle if you have one. Try to wait by the nearest window, and leave all door ways clear. This is so the fireman get to you without anyone getting injured. After, the fire is over. it may seem like all is lost, but this is where SERVPRO can help. We specialize is fire restoration, and are trained to help you in your time of need. Marketing Throwback. What an Awesome Day This Was! As a marketing rep. for SERVPRO I travel all over our territory and visit Realtors,Property Managers,Insurance agents, Nursing Homes, Hotels, and pretty much any other business you can think of. 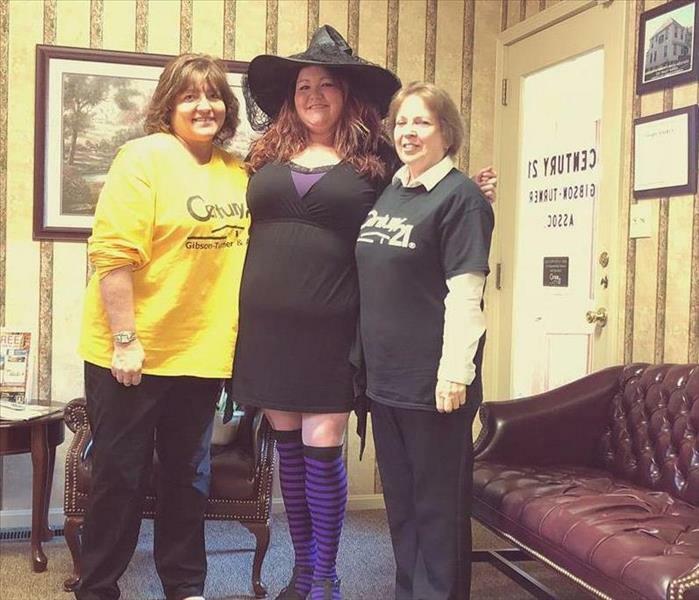 During October I always dress up and of course pass out candy.These are the ladies of Century 21 in Cambridge, Ohio. They loved my costume so much they wanted a picture. Of course they had to be in it with me sporting those fabulous Century 21 T-Shirts! Thank you so much ladies this was a great day and experience! I love being a part of our local business community and getting the chance to interact with so many wonderful unique groups of people. Services big to small. Homes and businesses. SERVPRO Zanesville/Cambridge is always there to help! When you choose SERVPRO. You choose highly trained technicians that have been taught to not only perform services, but to perform them in a professional safe manner. Every customer is important and gets that extra special SERVPRO touch. Our employees take pride in the work that they do and want to help make some of the worst times in peoples lives better and more manageable. We not only work with you. We also work very closely with your insurance agents and adjusters. This saves you time, and of course usually a headache. We want our customers to sit back and watch us get their homes to pre-condition loss. Taking away and preventing as much stress as possible for them. We get in and out as quickly as possible. So your disaster can be a thing of the past! We are one of the biggest restoration franchises in the world. We have built an outstanding reputation for ourselves, and are recommended by hundreds of different companies all over the world. If you check your national accounts list for sub-contractors. There is a good chance our name will be at the top of the list. We were founded in 1967 and have grown to over 1900 franchises throughout the United States and Canada. Most of our companies are family owned and get involved with our communities. When you choose SERVPRO. You are not just choosing a cleaning company. You are choosing your child's team sponsor or a big contributor to your local fundraisers. You are choosing a part of your community. We will do everything we can to not only keep your business, but your trust as well! Here at SERVPRO we want to make sure you are prepared for storms that may hit your area. A good way of doing so is to monitor storm activity around you. There are so many outlets to do so, there is really no excuse to not know what is coming your way. Along with the weather channel you have several resources available to keep updated. You can use phone apps like weather bug,Yahoo Weather, or Weather timeline. You can also utilize your social media as well. Most of the time your friends on Facebook or twitter will have announcements, and updates on your current storm situation. You can always follow our pages as well for updates in your area. Anything we can do to help! We are Trained to Care! When our technicians go onto a fire site we take in consideration that this is possibly one of the worst times in our clients life. They have just lost or damage has occurred to their belongings that they worked so hard for. We know that you are stressed, and kinda lost when it comes to what is next in the journey of your homes restoration. We make sure to keep track of all of our activity, and keep you updated so you always know what to expect. We also makes sure you do not have to do anything, but sit back and let us restore your home to it's prior state. If you call SERVPRO you are getting more than just a cleaning company. You are getting a friend, and partner in your time of need! When a water damage occurs everyone looks for, and expects there to be mold growth. However, it does not take a water leak for mold to occur. Any moist area can eventually produce mold. So what can you do to prevent that unwanted growth? To start it is important to keep your home properly ventilated to reduce moisture, and to consistently check high humidity areas for musty smells or visible mold. You can run a home grade dehumidifier to help prevent this.Mold can hide under your carpets, in your windows, or pretty much any other area that is not often checked. Always remember though, if you do find a hidden mold patch to give us a call. We can help, and are always waiting to do so. When our technicians are called to a water damage job they know what to expect. We bring all the equipment necessary to get the job done. We first go in and assess the situation. Usually we already have what we need on board. If there is standing water we extract it. Then of course we spray a anti-microbial to prevent mold growth. After this is done thee drying process begins. We set up our drying equipment which consists of air movers, and dehumidifiers. We then go in daily, and monitor the drying progress. We shortly know if a material is going to be able to be restored of if it will need replaced. Our fast system, and excellent techs save both you and you insurance company money by getting the job done fast! A fire can cause major damage to your home. That damage varies depending on the temperature of the fire, and what kind of material is being burn't. We can clean it all. Wet or dry soot natural burnt fibers or synthetic. We have the solution for the job. We usually use Wall and All rinse or another wet solution for heavy wet soot. This allows us to not only clean , but deodorize walls and other surfaces. So what do we do with dry soot, and walls that can't be wet? We use a DRY SPONGE. This sponge is magical and can clean and hold in soot from dry surfaces such as ceiling and latex painted walls. It allows our technicians to clean any surface any time! 10/10/2018 - Water it Should Be on Your Mind! 10/10/2018 - Fire Safety Month is Here!! 10/10/2018 - Marketing Throwback. What an Awesome Day This Was! 10/10/2018 - We Are Here To Help Every Step Of The Way! 10/10/2018 - Everyone Uses Us! 10/1/2018 - We Will Keep You Informed! 10/1/2018 - We are Trained to Care! 10/1/2018 - What Do We Do About Water?